Nifty and Bank Nifty 90 min charts turned to buy mode last friday with support coming around 5616 and 11266 respectively. 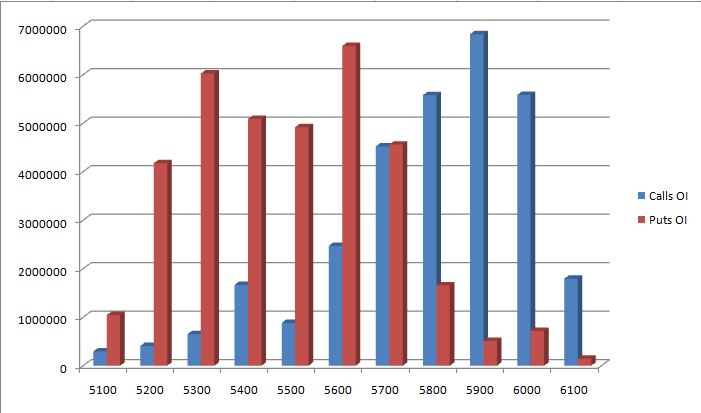 From the open interest charts it is observed that 5900CE holds the highest OI. i,e the Open Interest shifted from 5300PE to 5900CE which indicates 5900 could be the possible resistance for this season and also the considerable amount of open interest builtup seen in 5600CE which could bring temporary support for the November Expiry season. Thanks for nice suggestion and raising pertinent points in context of nifty. However, against the background of European situation and US election, trend may change anytime. I have been visiting your site for a long time and it has been of tremendous help to people like me. I hardly have proper words to express my thanks for your great help to small traders like me. Recently I have started trading commodity by looking at the chart at your site as I have no other way to get live chart in my Amibrroker or Ninjatrader (my Power Indiabulls PIB seems not to have the RTD feature to link to Excel to get live data in AB or NT and I didnt try any data provider for this -- I did try echarts after reading about it somewhere but they seem to be very bad and rude in their dealing with clients.). I suggest / request / wish that you also add two basic indicators RSI and Slow Stochastic in your live charts (in the place of blue and red boxes which hardly add to its value and only cover the important chart area.) With RSI and Stchs your great supertrend indicator may provide better hints/direction and we may have idea of reaching Sold-out or Bought-out level. That would be very helpful to people like us. Thanks again for all the good work you are doing for small traders. Please keep it up Mr Rajandaran. Thanks for your Extensive Feedback. at this moment i cant add additional indicators. Will just trying to come up with alternative solution.